We have just returned from a wonderful visit to the West Coast of America. It is such an expansive, huge land compared to our small island. In one day alone, we travelled across varied topography from snowy mountains to flat, baked Wild West territory and a belt of incongruous countryside that reminded me of Devon with rolling green hills and lush grass. Highlights - pelicans flying over the glittering Pacific with their saggy beak bags, streams falling through the mountain forests, blue crested jaybirds and groves of Giant Sequoia trees thousands of years old. Someone once said 'a culture is measured by what it preserves.' 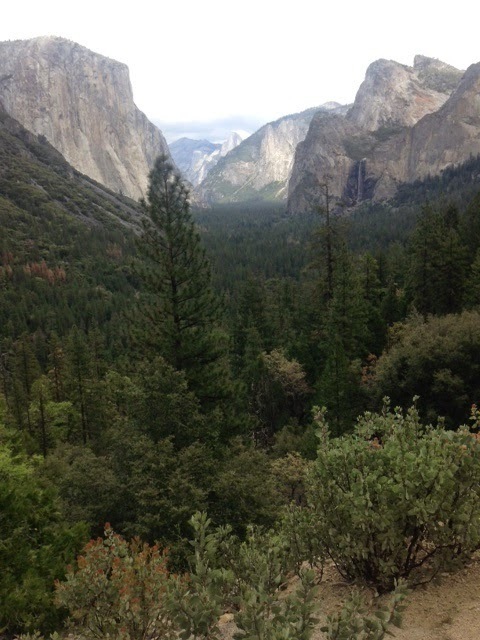 The 21st century has, I think, spoilt the tranquility of the Yosemite Valley with access for cars and buses. What tranquility there once was in the river basin has gone. It was not hard to imagine the native people working the earth and fishing and washing in the river. But across this huge glacial scrape of land, there was a belt of tarmac and a stream of traffic. Something was lost. We walked for a mile or two and wilderness was regained. Giant granite rock forms of a towering scale and distant circling hawks. And of course, we used the road to reach this special place in our car, relied upon it even, so perhaps opening up access is equally as important as preservation and the two are not entirely opposed. 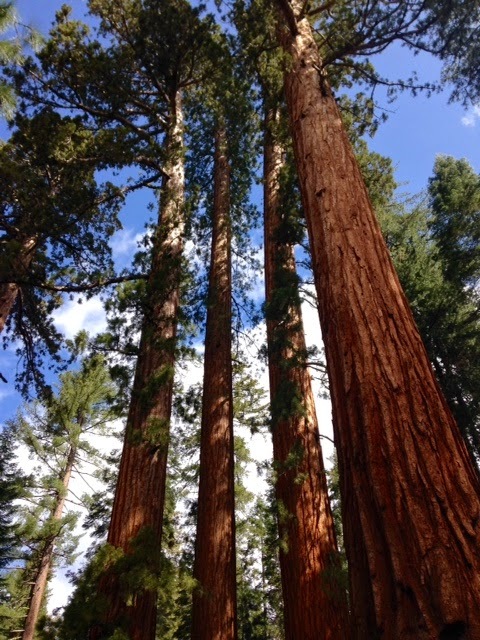 It was different in the Mariposa Grove of Giant Sequoias. These beautiful beings with their spongy, russet barks were peaceful. There was something serene and wise in the atmosphere around them. Something of CS Lewis' tales. We felt honoured to be walking among their trunks, the only people there, leaving our apple cores for the deer. Some of the trees had wonderful names - Bachelor and the Three Graces, the Fallen Monarch, Grizzly Giant, and this was where I felt inspired to write a 'poem'. What can I say about these trees in my inarticulate, jet-lagged state? Their longevity and heft was so non-human it was awesome in the original sense of word, in the way mountains can be. Their roots were like a brain, spread wide. The bark smelt of life passing, of seasons. Their immensity was comforting. They were beyond us but utterly present. Later, my daughter Bridy and I talked to a native American and he showed us how they wove baskets and traps from willow and used pine-nuts to make jewellery. It was a very privileged glimpse into a different world.